For Daniel Isengart, home cooking has always been an essential part of living a creative life. A cabaret performer and sought-after private chef in New York City, he knows how to deliver one delectable meal after another with the ease of a seasoned entertainer. The Art of Gay Cooking is a witty literary portrait that takes the reader from the author's grandmother's kitchen in southern Germany to his formative childhood years in Paris, from the attic apartment in Brooklyn Heights where he lives with his husband to his clients' posh homes in Manhattan and the Hamptons. Alternating intimate anecdotes and wry observations about the culinary world with over 250 easy-to-follow recipes, the book explores a rich, gay life devoted to beauty and art where the home kitchen always takes center stage. Jeremiah Tower, the eminent Godfather of modern American cooking, adds words of wisdom in his candid Foreword that describes how Isengart’s inspired approach to cooking brought back memories of his own beginnings as the original chef of the legendary Chez Panisse restaurant in Berkeley. Cleverly composed as an homage to The Alice B. Toklas Cookbook, The Art of Gay Cooking adheres closely to Toklas's idiosyncratic style, mirroring specific passages and echoing her amusingly eccentric tone. A chapter devoted to recipes from friends presents a poignant contrast to the limelight on celebrity chefs and restaurant food, proving that, at least in Isengart’s lively social circle of individualists, sophisticated yet unpretentious home-cooking is not a lost art. Daniel Isengart is a writer, cabaret entertainer and private chef living in New York City. He is the author of Queering the Kitchen: A Manifesto, based on his popular series at Slate.com and forthcoming from Outpost19. He has written on hidden gay culinary history for Jarry Magazine and elsewhere. Daniel is also the subject of The Autobiography of Daniel J. Isengart (Outpost19), written by his partner Filip Noterdaeme. Most recently, he's published a notable review of The Gourmands' Way by Justin Spring (PW Nonfiction Book of the Year 2017) at Slate. 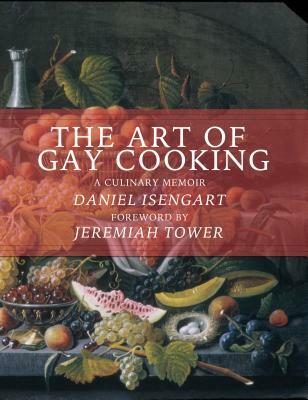 If you're unable to attend the event and would like a signed copy of The Art of Gay Cooking, please purchase the "Signed" version below.